But still, here was my chance to taste the forbidden! I was especially excited to try a raw milk Epoisses. Epoisses is one of my favorite cheeses, and I have a lot of personal attachment to it. Well, as much as you can for a small, stinky, gooey little cheese. But it was the cheese I brought to Carla when I proposed (making sure it was two week's past its "best before" date, so it would be adequately pungent). Plus it was a cheese that really made me want to get into cheese making, so I could enjoy my own raw milk Epoisses-style cheeses at home. 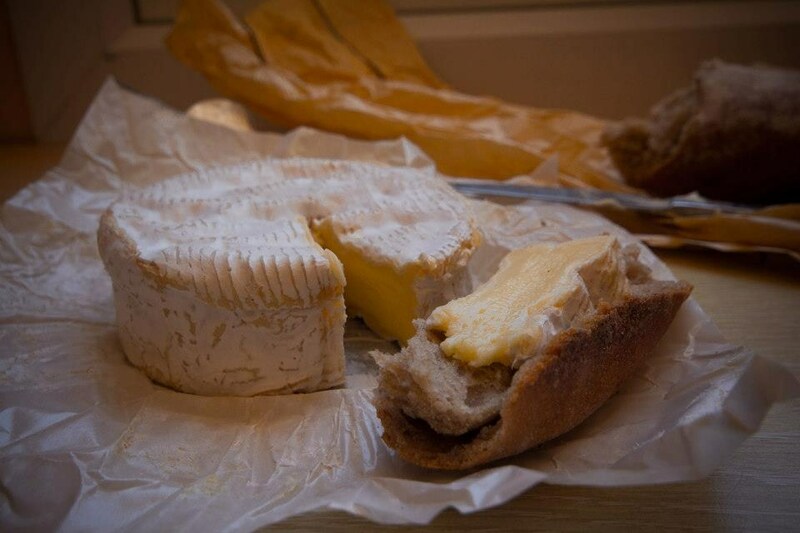 So once in France, I began my search for a raw milk Epoisses. In the meantime, I came across great raw milk Camembert de Normandie AOC. This was a perfect cheese - the inside was a bit runny and supple, but still with a youthful, fresh flavor and long woodsy, mushroom flavor. It was simple, basic, and absolutely dead-on. And I bought it at a shop across from my hotel. It wasn't towards the end of the trip that I finally found and tried a raw milk Epoisses. This was in a very classy cheese shop in Paris, where the maitre-fromager showed me how to pick out the best, ripest one. And it was just ok. But when you look forward to something for months and make a concerted effort to realize your goal, well..."just ok" is kind of a disappointment. I expected intensity, salinity, and farmyard beefiness to be exploding from this cheese in every bite. And while the texture was nice, the flavor was two-notes: salty and sharp. Today, my memories focus on the Camembert. A milder cheese, without the trials and tribulations of the Epoisses attached to it, but perfect. Having worked with artisan cheeses for going on seven years now, I understand small-batch cheeses can be unpredictable and temperamental. But there's still something to be said for the little Camembert, and the comforting taste of being consistently perfect in its own way.